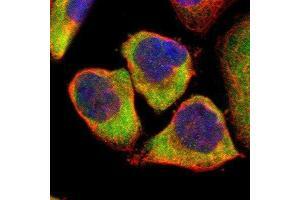 Immunocytochemistry/Immunofluorescence: CLIC4 Antibody [NBP1-85574] - Staining of human cell line A-431 shows positivity in cytoplasm. 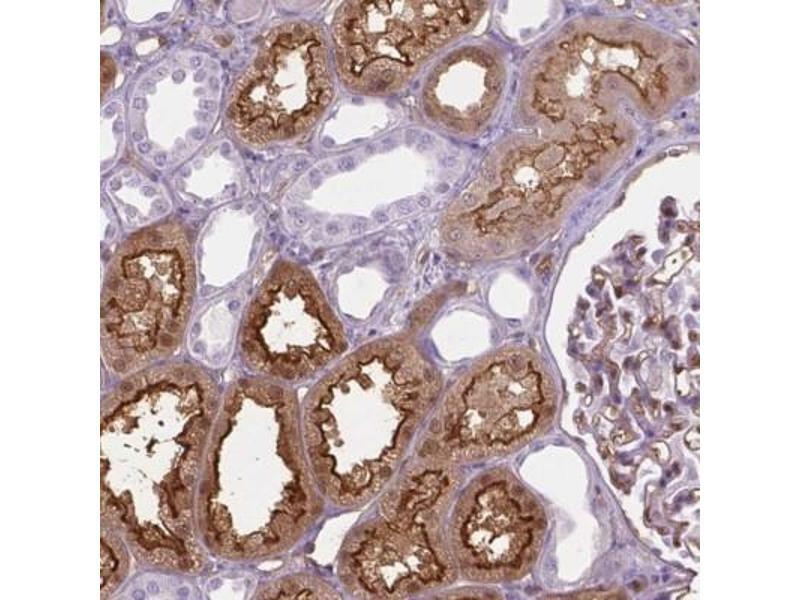 Immunohistochemistry-Paraffin: CLIC4 Antibody [NBP1-85574] - Staining of human kidney shows strong nuclear and cytoplasmic positivity in cells in tubules. 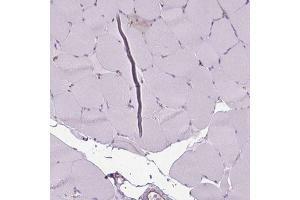 Immunohistochemistry-Paraffin: CLIC4 Antibody - Staining of human skeletal muscle shows low expression as expected. 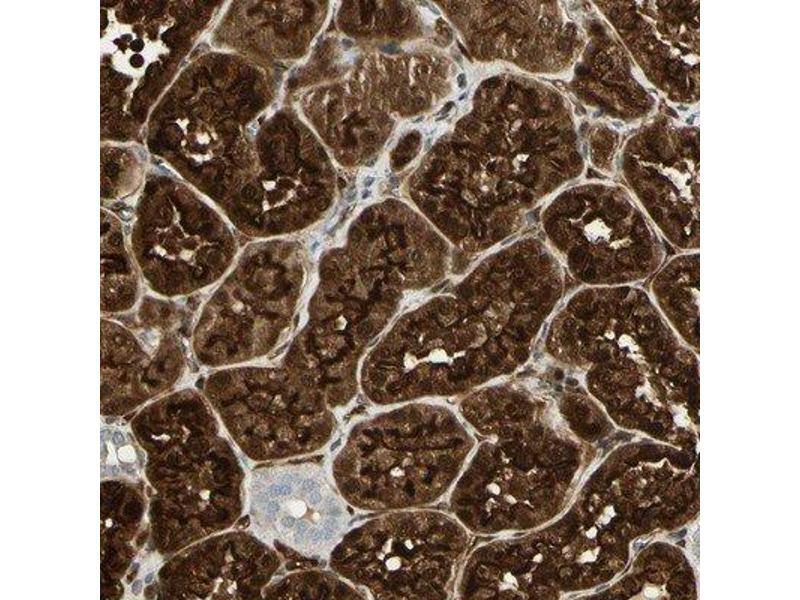 Immunohistochemistry-Paraffin: CLIC4 Antibody - Staining in human kidney and skeletal muscle tissues using anti-CLIC4 antibody. 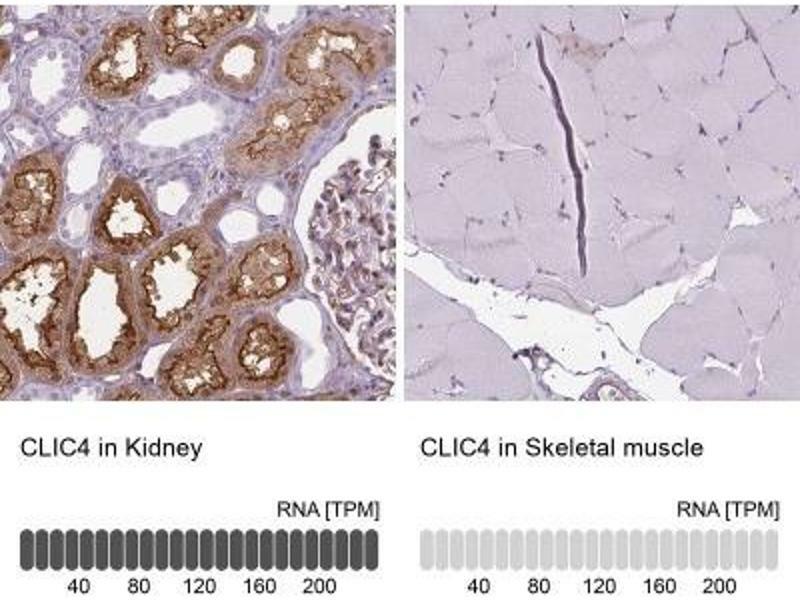 Corresponding CLIC4 RNA-seq data are presented for the same tissues. 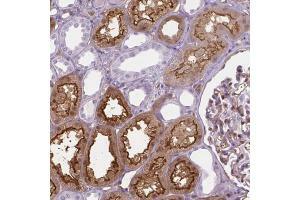 Immunohistochemistry-Paraffin: CLIC4 Antibody - Staining of human kidney shows high expression. 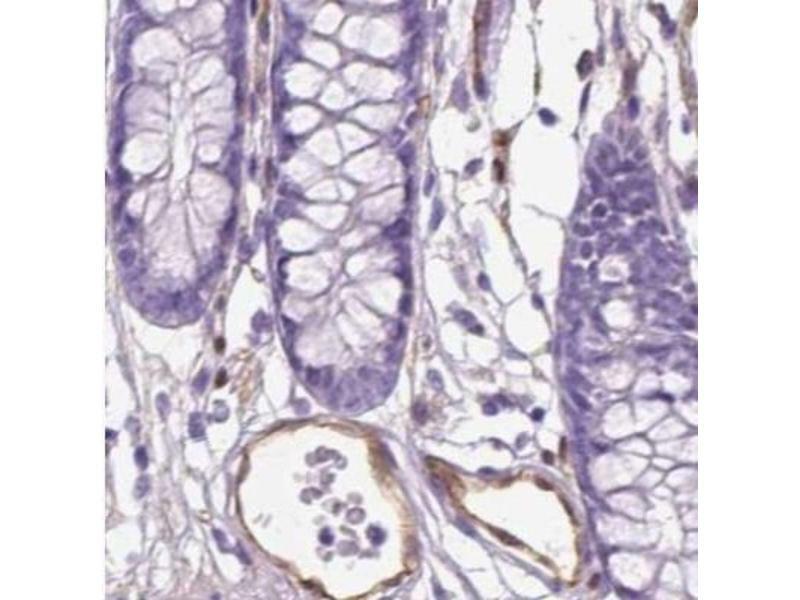 Application Notes Western Blot 1:100-1:500, Immunohistochemistry 1:10-1:500, Immunocytochemistry/Immunofluorescence 1 - 4 μg/mL, Immunohistochemistry-Paraffin 1:20-1:50For IHC-Paraffin HIER pH 6 retrieval is recommended. 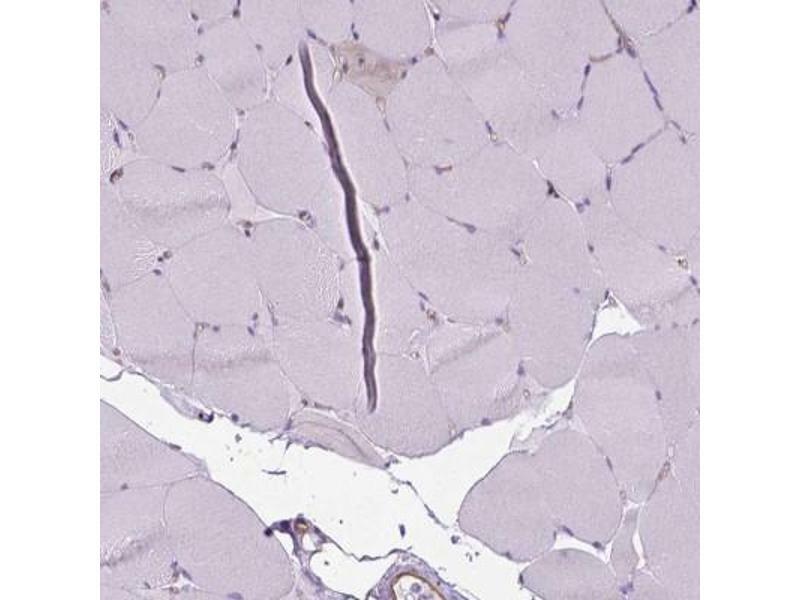 IF fixation permeabilization: PFA/Triton X-100. 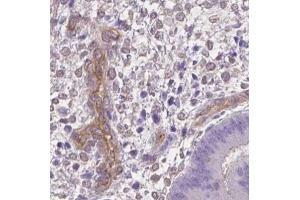 Immunohistochemistry-Paraffin: CLIC4 Antibody - Human endometrium using Anti-CLIC4 antibody. 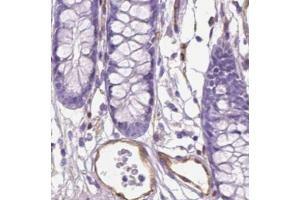 Immunohistochemistry-Paraffin: CLIC4 Antibody - Staining of human colon using Anti-CLIC4 antibody. 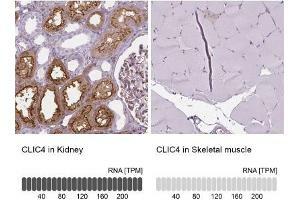 Immunohistochemistry-Paraffin: CLIC4 Antibody - Staining of human colon, endometrium, kidney and skeletal muscle using Anti-CLIC4 antibody ABIN4299203 (A) shows similar protein distribution across tissues to independent antibody ABIN4299204 (B). Product cited in: Yan, Zhang, Hu, Ma, Hou, Zhang, Wang, Gao, Shen, Lv, Ohtsu, Han, Wang, Chen: "Histamine H3 receptors aggravate cerebral ischaemic injury by histamine-independent mechanisms." in: Nature communications, Vol. 5, pp. 3334, 2014 (PubMed). 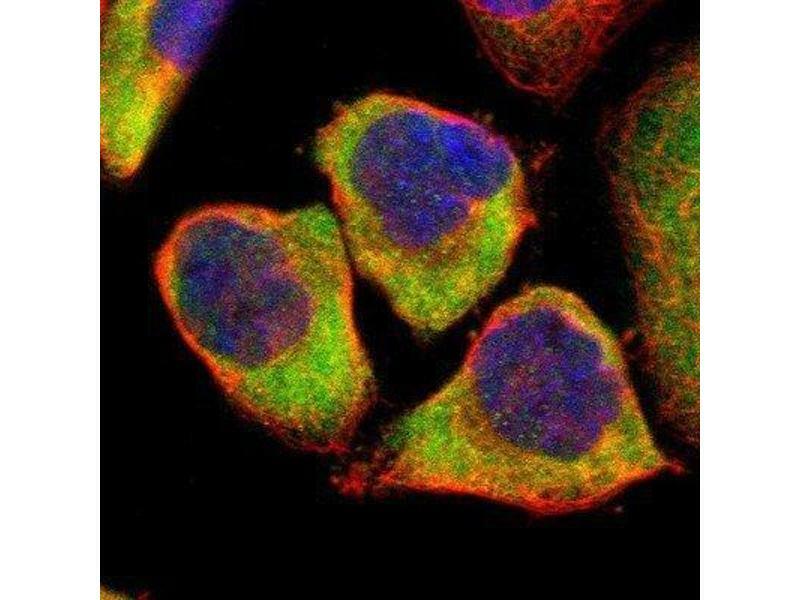 Stadler, Rexhepaj, Singan, Murphy, Pepperkok, Uhlén, Simpson, Lundberg: "Immunofluorescence and fluorescent-protein tagging show high correlation for protein localization in mammalian cells." 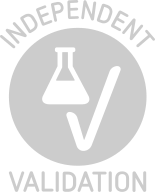 in: Nature methods, Vol. 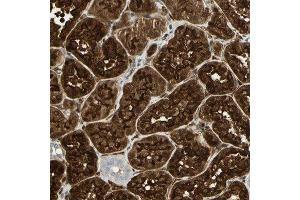 10, Issue 4, pp. 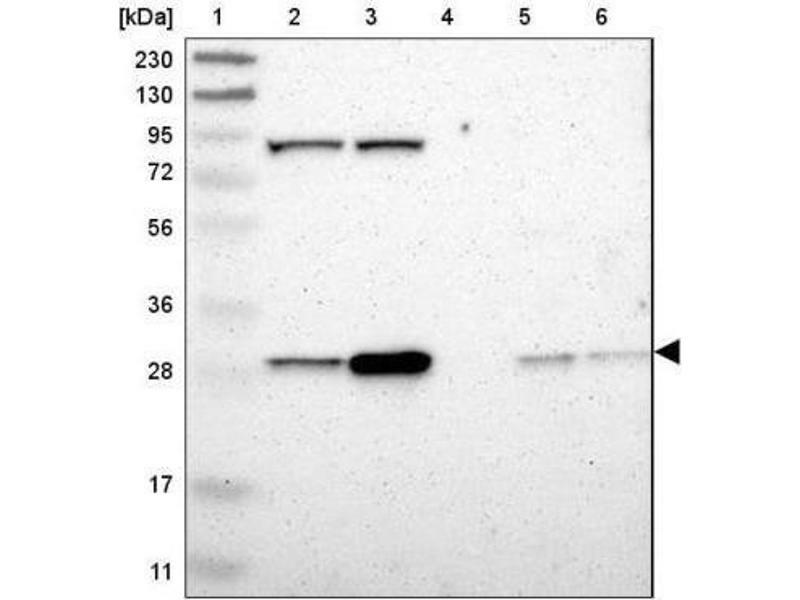 315-23, 2013 (PubMed). 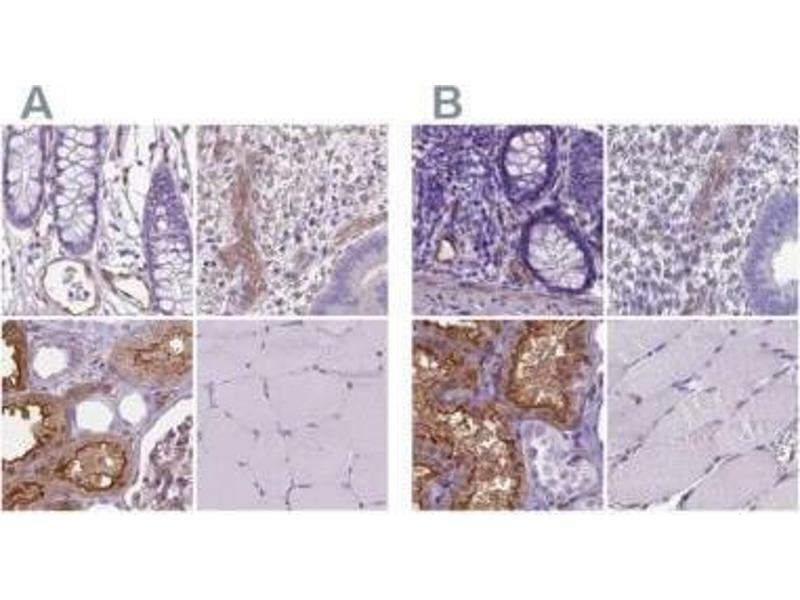 Lomnytska, Becker, Gemoll, Lundgren, Habermann, Olsson, Bodin, Engström, Hellman, Hellman, Hellström, Andersson, Mints, Auer: "Impact of genomic stability on protein expression in endometrioid endometrial cancer." 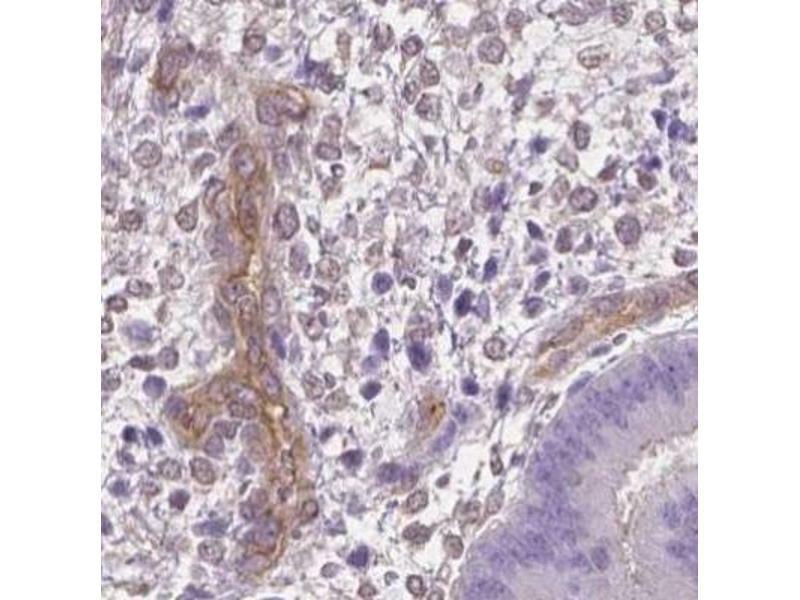 in: British journal of cancer, Vol. 106, Issue 7, pp. 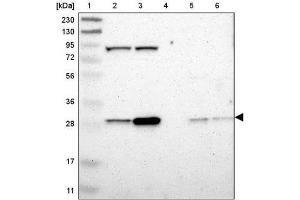 1297-305, 2012 (PubMed).